Why, yes, I did draw this with a Sharpie! Thanks for asking! Did we ever get around to using these characters in the RPG playtests? I can’t remember. 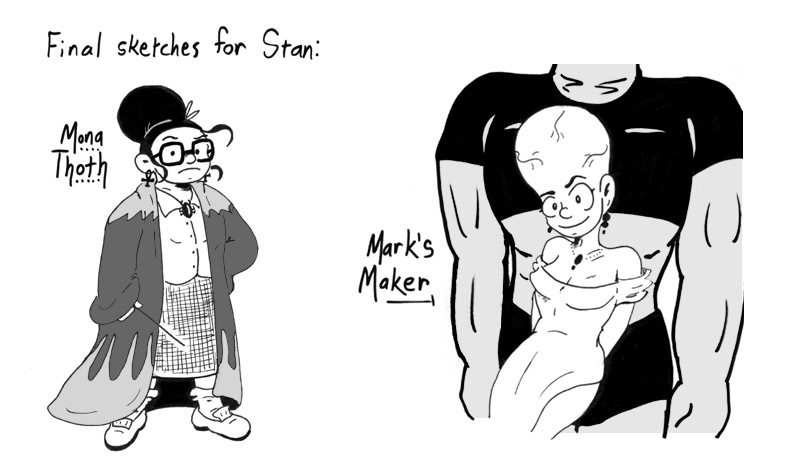 After doodling these, I was kind of sorry I never included any giant pulsating brains in Narbonic. Giant brains are actually pretty great. I was totally into the movie Lady Frankenstein around this time. Actually, just the poster, which looks nothing like anyone or anything in the film. Of course I also love Manos: The Hands of Fate, one of the quintessential “Mystery Science Theater 3000” movies. Not my best drawings, but I should have done this type of feature more often. 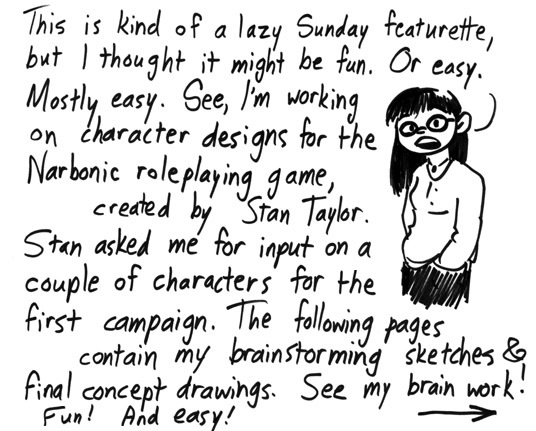 I’ve been trying to include more production stuff in the Sunday features for Skin Horse. Today I’ve realised that elegant bald ladies exemplify a certain kind of sinister retro science-fiction better than anything else. I realise that it’s a necklace now that I’ve looked again, but on first glance I thought that was some sort of port or shunt on Mark’s Maker’s neck. Does he call her ‘mom’? THIS is why you absolutely MUST share the Narbonic RPG with us! I mean, really now, if there can be RPGs about Maids (http://www.maidrpg.com/) why can’t we have a Narbonic/Skin Horse RPG And Resource Book?